QR Codes Everywhere But Higher Ed? I’ve blogged a few times about the increase of use of QR codes by companies, especially when it comes to marketing. Their use is especially on the rise, and I’m encouraged each time I see a large company begin to roll them out for their customers. 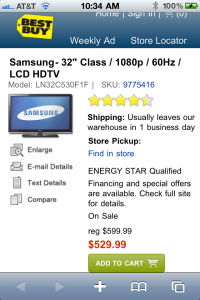 That QR code takes you to a mobile version of that product’s page at Best Buy’s mobile website. It’s nice if you want to see some additional information or reviews and don’t want to be bothered by the sales droids. I don’t know about you, but I often find myself knowing more than they do about electronics, but that’s a discussion for a different day. Here’s the page. You can click for a larger version. Did you see what they did there? The price on the mobile page is $70 less than the store price. When I asked the sales droid about it, he said the online site often is updated before the prices in-store. He said Best Buy will match prices in their online store at any time. 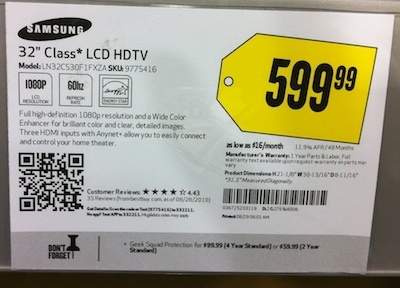 So, had I actually been buying this TV, that little QR code would have saved me $70. Not all QR codes are sales drivers, but perhaps they could be a nice little incentive for tech-saavy customers offered by tech-saavy businesses. Previous Previous post: You Do Google Your Institution, right?